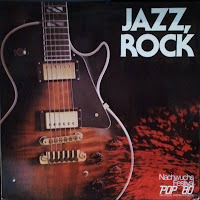 Is it even possible to get tired of deutsches jazz oder rock? Nicht fur mich aber some out there might be reaching the breaking point. 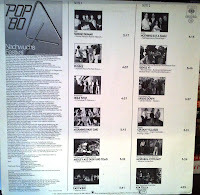 This LP won't contribute to that particular straw that broke the camel's back threading its way through the eye of the needle of the kingdom of god (of prog) because it contains some quite enjoyable music from relatively unknown (at least to me) bands. 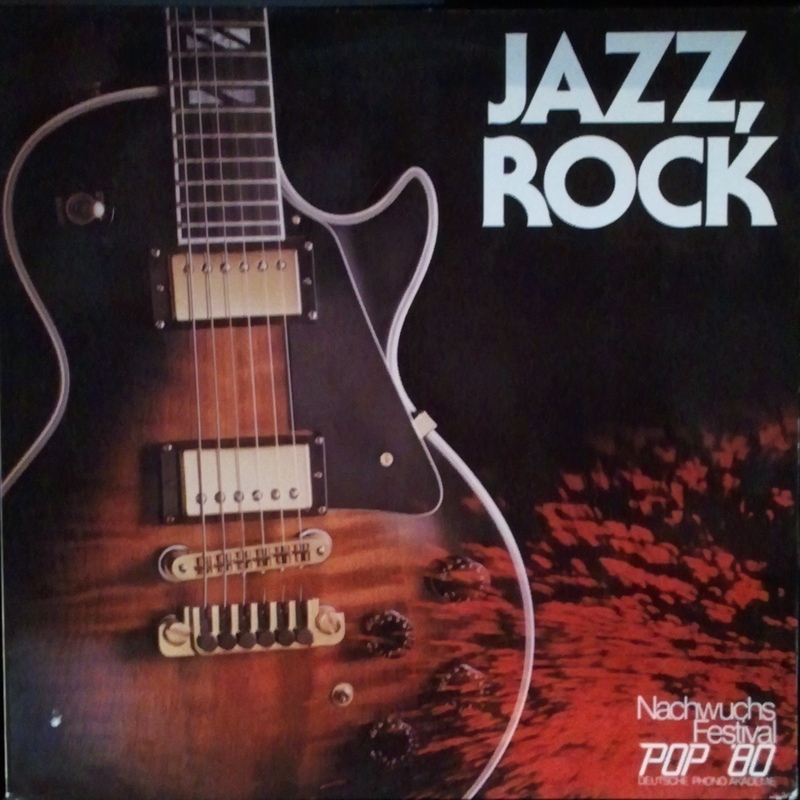 Please note that notwithstanding the title most of this record is pop or rock with only a minority of jazz and of that, of course, no true swinging jazz appears but only fusion. http://www.growingbinrecords.com/ In this mixture we get some straight fusion (Naima), some straight rock or pop (the female-sung Artischock really impressed me), there is some really out and out progressive jazz-rock with the Jeff Beer and Jurgen Schmitt entry, which you all will sit up and take notice of when it plays for you-- guaranteed. 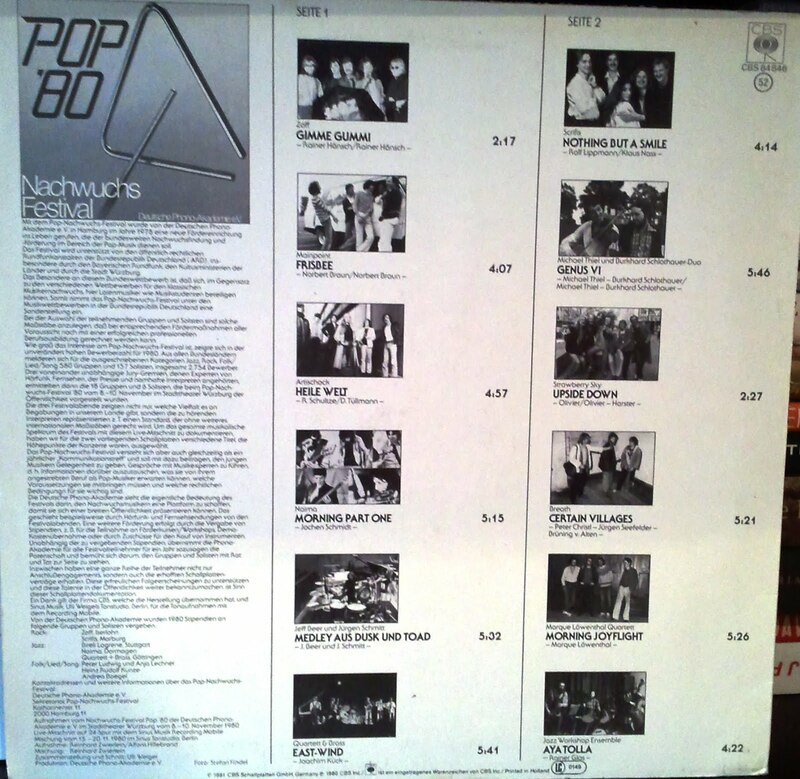 And plenty more pop, rock, jazz, and experimental music on side 2. Make a note as well of track b2 by the Michael Thiel und Burkhard Schlathauer Duo, which reminds me eerily of David Rose's playing or Didier Lockwood (manufacture du sucre engloutie). Anyone out there know them already? I daresay it could almost be a lost ZAO track. Fabulous long-lost gem; as I said, we must give credit to record-hunter extraordinaire discobasso here for unearthing this german treasure... It amazes me how some of these connoisseurs are so far ahead of me in their knowledge of lost vinyls. Incidentally, notice how long this record is, side one is roughly 26 minutes, side two about the same. And here is the "lost zao track"
Now please stay tuned to our show because I will be posting very soon an absolutely stunning progressive discovery, that is utterly unknown. How such a magnificently well-written and beautiful record can be lost to time so completely as usual is unimaginable to me and impossible to believe. You too won't believe how good this record is when you hear it-- it has everything, jazz, rock, folk, and that progressive edge that we love so dearly: we're talkin' unusual chords, strange instrumentation, weird changes, dissonances (minor seconds and tritones) everything you adore. But there is a consolation-- we have rescued it from oblivion. Fantastic! What an excellent find. Thank you so much for the share. Many thanks for another rare find! phenomenal record brother, and let me say one more thing to everyone, this record shop is amazing for its reasonable pricing (totally you can trust nothing is overpriced) and the fact you can sample every single record, guaranteed!! where have you seen this before?! Hallo, it is possible to re-up MP3?